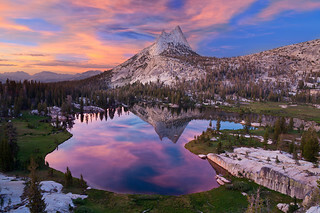 I wanted to spend a night at Cathedral Lake, but the backpacking passes were all reserved months ago. Fortunately, Yosemite holds 40% of backpacking passes (10 passes in the case of Cathedral Lakes) as first-come-first-serve. I arrived at the Tuolumne Meadows Wilderness Center at 6:50 AM the day before I wanted to do the hike. I set up a lawn chair and watched a movie/read a book/helped a guy fix his car for four hours, until they gave out the passes at 11 AM. Fortunately, I scored passes! Most people camp at Lower Cathedral Lake, but we continued to the more scenic Upper Cathedral Lake. We set up our tent on a ledge of the cliff overlooking the lake. It may not have been the most practical or accessible campsite possible, but it certainly was the most scenic.